The George Adams Gallery is pleased to announce Over the Golden Gate, 1960-1990, an exhibition of works by Robert Arneson, Joan Brown, Bruce Conner, Roy De Forest , Peter Saul, Mark di Suvero, Wayne Thiebaud, and William T. Wiley. The exhibition, organized by the George Adams Gallery and Tajan ARTSTUDIO, Paris, will be on view at L'Espace Tajan beginning on October 20th to coincide with FIAC at the Grand Palais, Paris. Covering a span of 30 years, Over the Golden Gate surveys the work of eight singular artists from the San Francisco Bay Area and includes over 30 paintings, sculptures, drawings and photographs. The exhibition is accompanied by a fully illustrated catalogue in English and French with an essay by Hilarie Faberman, Curator of Modern and Contemporary Art at the Cantor Center for Visual Arts at Stanford, University from 1993 to 2014. 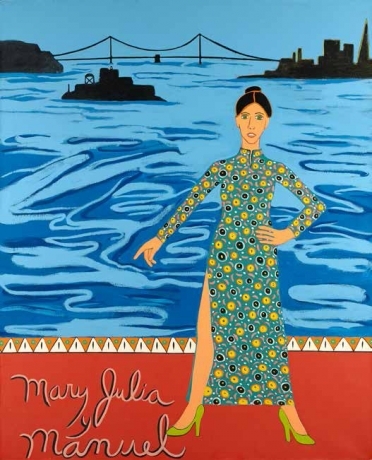 Over the Golden Gate: Artists of the San Francisco Bay Area, 1960-1990 will be on view at Tajan ARTSTUDIO from October 20th through October 28th, 2016. There will be an opening reception the evening of October 20th from 6 pm - 10 pm. Selected works from the exhibition will be on view at Tajan through December, 2016. As part of the Tajan ARTSTUDIO program, a series of special exhibitions held at L'Espace Tajan, Paris, is a special exhibition focusing on artists of the Bay Area, from 1960-1990. Including the work of Robert Arneson, Joan Brown, Bruce Conner, Roy De Forest, Peter Saul, Mark di Suvero, Wayne Thiebaud and William T Wiley, it is the first exhibition of its scope and focus to be presented in Paris. A catalog with essay by Hilarie Faberman has been published for the occasion. To see the catalog, or for more information about the exhibition, please follow the link below.